One of the highlights of my fall semester last year was getting to know one of my 4th grade students, Edgar, a little better. In October I learned about the absolutely fantastic builds he’s made on the Android version of Minecraft Pocket Edition, and a week later we recorded this 15 minute video together where he took me on a tour of his creations. The things he has built in Minecraft are truly spectacular. In addition to recording that video, I was able to share the videoÂ with most of my STEM classesÂ in subsequent weeks to highlight his creativity and Minecraft skills as exemplary. I think that meant a lot to him. 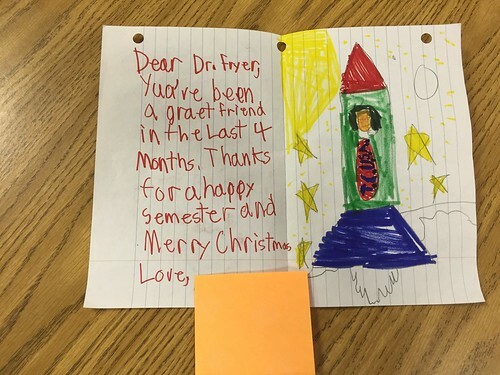 I received a very sweetÂ Christmas note from him just before break. After making aÂ connection to OscarÂ through Minecraft, he started bringing some different DVD videos to school for me to borrow and watch. The first one was about tornados and stormchasers. The second one was the 2014 movie, “God’s Not Dead,” which I’d heard about but never seen. As a STEM teacher, I talk a great deal about science, our scientific understanding of the universe, but don’t talk about my faith or Christianity. Talking about my faith during class in a public school, as a public school teacher, would not be appropriate. I think Oscar loanedÂ me the movie,Â “God’s Not Dead,”Â (he actually had checked it out of a local public library) because he things I’m an atheist. I asked him if he wanted me to watch the movie so we could discuss it, and he said yes. We didn’t have an opportunity to visit about it before Christmas break, and I won’t have him in class during the spring semester because of our rotation schedule for STEM and Art classes. I was very touched that he wanted me to watch the movie, however, and I plan to talk privately with him about this at an opportune moment when we get back to school. Perhaps not coincidentally, the Friday morning after Christmas (when Mark Veasey shared his testimony) one of the guys at my table for our men’s group was talking about having just seen “God’s Not Dead.” I told him one of my students had loaned me the movie to watch, and this friend (Ron Bath) encouraged me to watch it. I thought the portrayal of Christians and Christianity inÂ “God’s Not Dead”Â was very good. Certainly there are all kinds of beliefs and Christian denominations, and it’s impossible to generalize with complete accuracy what “Christian faith” means to everyone. The movie’s focus on “God is good, all the time,” and that God places us in exactly the right place at the right time to do his work resonated deeply with me. The college professor who is a main character in the film grapples with the existence of evil, and like many others has anger for how a benevolent Creator could exist who would allow evil to apparently flourish in the world. Without a doubt this is a HUGE question, and one which turns many people away from faith in God around the world. Praise God for his goodness and his faithfulness! My God bless you and your family this new year in 2015. Today in our fifth grade Sunday school class, we discussed Edmond 6th grader Grayson Chance and his experiences on the Ellen show Thursday. To start, the students brainstormed answers to three different questions in pairs, and then we shared/discussed them together. (Turn/Pair/Share activity) Each time students had 45 seconds to brainstorm and write down ideas, and then we shared/discussed aloud. Remember these are the results of what STUDENTS brainstormed, not my OWN ideas / lesson notes. – How many of you have heard at least 1 Lady Gaga song before? – How many of you personally OWN at least one Lady Gaga song on your iPod, as a CD, on your own music player? 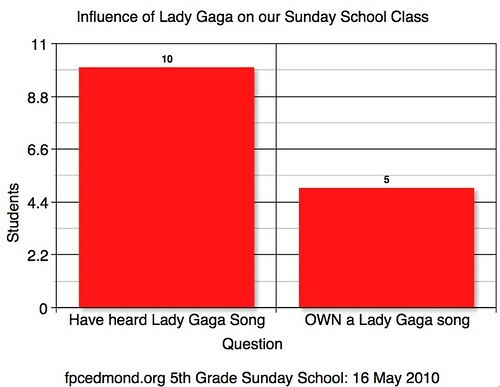 These results confirm what I had suspected about this topic: Lady Gaga has a HUGE cultural influence and our 5th grade students not only know about her and are listening to her music, they also know about what happened with Greyson Chance, YouTube, and the Ellen show last week. We watched this two minute video from the Washington Post about Greyson, the Ellen Show, and Lady Gaga. What do you think the message(s) of Lady Gaga are for YOUR life? My message in our lesson today IS that we need to take a lot of care when we choose what we put into our brains and hearts through our eyes and ears. Also, a message is that people judge / form opinions about us based on what we SAY (what comes out of our mouths.) We need to strive to follow the words of Jesus and fill ourselves with LIGHT instead of darkness, to be pure and clean vessels. We discussed the context of this verse in the early church, when non-Christians were sacrificing animals and eating that sacrificial meat. Jesus’ reference to “unclean meat” not polluting our minds is a reference to that meat, which is something Paul wrote about in several of his New Testament letters. This verse and story (which is a very short parable) says that if we say corrupt and vile things, they reveal what is truly in our hearts. I shared how over the past several months, I have listened to the songs in both of Lady Gaga’s albums, because my 9 year old daughter had purchased “Paparazzi” and as her dad I felt it was important for me to know what messages that song was teaching. We talked about how when we choose to listen to songs and watch videos, the words and messages of those songs are “teaching” things to our minds/brains. I addressed the student comment that “The lesson of Lady Gaga is ‘No matter what you do you can be Christian”” as being false and a trick. We should avoid being confused by Gaga / Stefani saying she was raised Christian / Catholic, and that she therefore is sharing a Christian message. The words of her songs and the messages of her songs/videos are NOT to follow Christ or live a moral life. We looked at the numbers of views on Greyson Chance’s YouTube channel, and discussed how remarkable it is that a 12 year old 6th grader from Edmond (right where we live) is having this chance to talk directly with millions of people worldwide. We live in a day when we are more connected than ever, and where we have more opportunities to make choices about what we listen to and watch. We need to choose wisely. We closed our lesson in prayer for God to help us make good choices about the things we say / the things we choose to let out of our mouths, as well as the things we let into our minds and hearts. These are very challenging issues to address and discuss with our students, and I certainly tried to tread lightly on some of them. The informal surveys we did today confirmed what I knew going into today’s lesson, however: Gaga’s cultural influence on our children/youth today is HUGE, and we need to be talking about these issues. In March CNN reported Gaga has more views on YouTube than any other artist in the world. In our own family, these issues have been important in past weeks because I’ve had to decide (as the dad) what will go on our iPods? Should Lady Gaga’s song be on them? While I am not and did not share the message with our 5th graders, “Lady Gaga is the devil,” I have no doubt that Satan IS spreading his lies through her music and videos. In class today we DID talk about who “the father of lies” is, and that he IS real. We need to look at the words and messages which come out of the mouths of others, to discern if they are messages with which we want to fill our minds. See my post yesterday on my main blog, “From a church talent show to the Ellen DeGeneres Show: YouTube fame for an Edmond 6th grader” for more background and thoughts on this situation, especially as they apply to Internet safety and Greyson specifically. Cody (our co-teacher) discussed with me after the lesson the popular song “Kiss – Kisse” by Holly Valance. Kids as young as three are running around singing this song today, and as parents/adults we need not just take notice but take action. One of the basic things we all need to be doing in our homes is TALKING about these issues: Finding out what our kids know, what they are hearing, what they are listening to, and what they believe. If our kids (as at least one of our fifth graders today) believe “You can do anything in life and be a Christian,” that is a serious misconception that needs to be addressed. We need to all put on the full armor of God. We’re living in the midst of a culture war, and our own hearts of minds as well as those of our children are at stake. Whoever has my commands and obeys them, he is the one who loves me. He who loves me will be loved by my Father, and I too will love him and show myself to him. We love to listen to Go Fish! 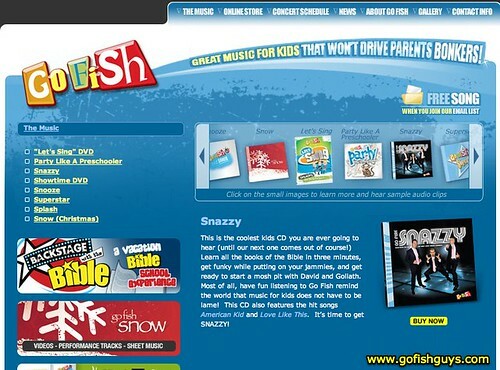 Thanks to a recommendation from my Sis over the holidays, our family is now LOVING songs from the album “Snazzy” by Go Fish! 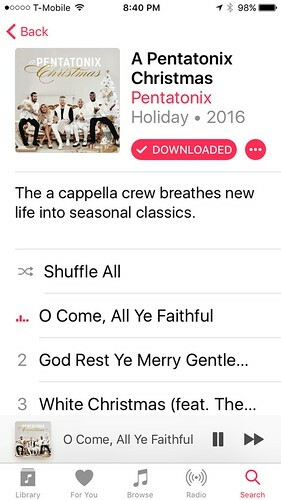 I bought this on iTunes a few weeks ago. My current favorites are “Superhero,” “Snazzy” and “Bible Book Bop.” Their rendition of “The Itsy Bitsy Spider” is very catchy as well. My 5th grade Sunday School class started making a video for “Bible Book Bop” today, which I hope we’ll finish with some green screen videography next week. The Go Fish Guys ROCK!